Partnering with a local high school, in 2014 Oberg established the Junior Apprentice Advantage (JAA) program. Shown are members of the 2017 JAA team. Celebrating 70 years in 2018, Oberg continues to grow. Since 2011, when the company earned its Pioneer Award, its sales have grown from $105 million to more than $130 million, as have its employee roster—now more than 800 —and floor space. In addition, the company has invested $15 million in new equipment in just the past three years. The company’s motto: “Customers rely on us and we rely on our people.” Backing up those words, Joe O’Brien, Oberg’s director of human resources, cited a laundry list of initiatives to attract, retain and grow its workforce while noting that the company now hires 40 to 50 employees per year. 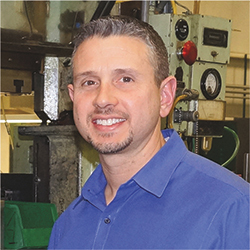 Having just completed an associate’s degree in Mechanical Engineering, Jason Oskin started as a machinist apprentice at Oberg Industries in 1995. Many of his first days included changing floor tile in the shop. “I think some of that may have been just to see if I would see this through,” he laughs. 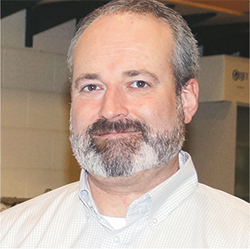 But see it through he did, and today he serves as additive manufacturing technical manager, leading efforts to develop and master the technology to better serve Oberg customers. Throughout his apprenticeship he studied not only machining but related processes such as grinding, and underwent inhouse training to gain proficiency on topics such as blueprint reading and die components, to name just a few. With his machinist journey papers in hand, Oskin’s next stop was NC programming, as management noted his proficiency on NC machines. After two years spent in programming, he took the opportunity to focus on engineering, particularly die design and then debugging stamping tools, which he found challenging and exciting. Oskin parleyed his experience, including 15 years in engineering, to take advantage of an opportunity in additive manufacturing (AM). Three years ago he was approached to run an AM machine at the University of Pittsburgh to help Oberg gain knowledge and expertise on the innovative technology. For the past two years, he’s been managing the Pitt AM lab. Growing up nearby, Oskin had been familiar with Oberg, and it was the first manufacturer to which he applied. Besides providing for his rewarding career, the company has been a very family-oriented place to work, he says. The first company in Pennsylvania to establish a registered, certified apprenticeship program in manufacturing, Oberg now offers more than a dozen apprenticeship programs. Two years back Oberg started another, for CNC programming, that joins three other apprenticeship programs instituted within the past five years. Whereas at one time a few veteran employees would serve as apprentice leads, Oberg has formalized and professionalized the process via a full-time training programs manager, Linda Wood, and a staff of five. Recognizing its long-time employees with vast knowledge and experience to share, the company has instituted a phased-retirement program. Here, retirees can return in part-time roles to transfer their knowledge and skills to up-and-comers. Oberg also has upgraded its Radical Referrals program, which pays as much as $5000 on employee referrals for machinists and others with special talents. Oberg remains proactive in other ways while seeking out qualified applicants. This includes relationships with local vocational schools and career centers and, more recently, a deep dive into high schools. This includes placement of equipment along with STEM training and teaching methods—essentially pre-apprenticeship programs, according to Greg Chambers, Oberg director of corporate compliance. 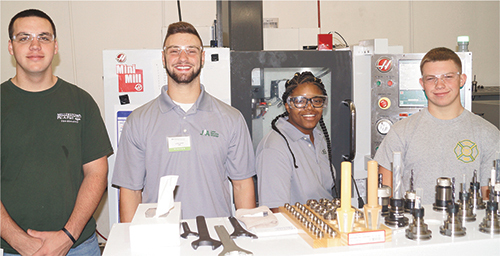 Partnering with a local high school, in 2014 Oberg established the Junior Apprentice Advantage (JAA) program, offering industry-specific training to qualified high-school students and providing an avenue for the company to interact with the students and their parents on apprenticeships and the value of manufacturing careers. Like his colleague Jason Oskin, Bill Broman also started his career at Oberg in 1995, with a four-year Engineering degree in his pocket and with positive company reviews from friends. Determined to carve out a role in engineering, Broman was placed into a four-year tool and die apprenticeship. As part of a well-rounded, thorough program, this included a tour through various Oberg areas including stamping, die maintenance and the toolroom. He specifically recalls his work during this period as a detailer, where more senior personnel would check his detail prints. Toward the end of his apprenticeship, Broman began designing tools in teams, which provided an opportunity to pull knowledge from other more-experienced team members. Following his apprenticeship and after 12 years in die design, Broman had the opportunity to work with a new medical customer, often traveling to meet with the customer’s engineering group. “I gained a lot of experience working with customers and designing for manufacturability, and following through with our people on the shop floor,” he says. After four years on that project, Broman took a program manager/process engineer position in Oberg’s stamping department, focused on process-improvement. During three years here, he expressed the desire to enter management. With a master’s degree in Business Administration—paid for by Oberg—he moved into his current role, helping develop and implement Oberg Process Excellence, the company’s process-improvement initiative. Only 22 years old and newly married when he started at Oberg, Broman’s initial focus was not on the long-term. But now, after 23 years, he looks back and realizes that the company gave him the opportunity to have a career and family life, and explore various areas of manufacturing and management. “Instant pay combined with the ability to earn a degree with no college debt after successful apprenticeship training has been a real eye-opener to high-school students,” says O’Brien, commenting on JAA. Oberg also has expanded its co-op activities with high schools and colleges, which helps promote the company and attract potential employees. Doubling down, as O’Brien says, on agility with its own diverse workforce, the company has implemented what it calls a transferable-skills index with the goal of providing skilled personnel in all areas of manufacturing in response to business ebbs and flows. Of course, success here rests on the ability to assess skill levels and cross-train. “Employee development is overlooked by so many companies in our industry,” says Chambers, stressing that employees can’t be expected to grow and succeed without resources or skills development. To that end, the company has invested heavily in mentor training via a formal four-week classroom and shop-floor program to develop employees tasked with developing those under them. Those completing the course receive NIMS certification for on-the-job training and are compensated for their efforts—Oberg currently has 62 NIMS-certified mentors and predicts as many as 90 by year’s end. Also, via the National Network, Oberg has instituted a Common Employability Skills curriculum featuring weekly one-hour sessions taught by employees and taking into account nontechnical skills such as communication and critical thinking.